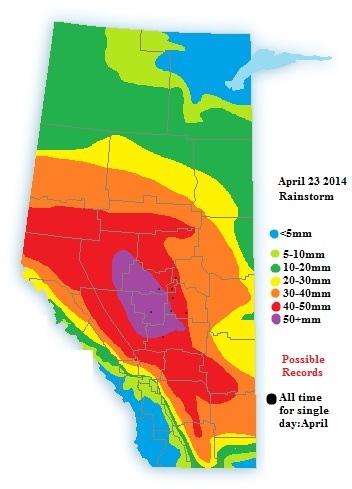 Record breaking rainfall possible in large areas of Alberta! Starting tonight and lasting partly into Wednesday amounts of 30-70mm are expected to fall over a large part of Alberta. The significance of this system is the time of year. All time records for a singly day rainfall in April are lower, around 25-50mm. This means that the forecast amounts are record breaking. Stay tune for more updates. EC will likely issue a summary of the if records are broken. AlbertaWX Gear is finally available! Get all you’re awesome AlbertaWX chase gear at our new store!